Pictured, left to right, are Mike Harter (DCAS Board member), Jon Melvin (DCAS Board member), Acting ODA Director Tim Derickson, Andrew Brenner (Fair Supporter Award winner) and Chip Thomson (DCAS Board member). COLUMBUS — Forty-four individuals and one group were recently recognized at the 94th Ohio Fair Managers Association convention at the Greater Columbus Convention Center for outstanding service to their local fairs. Of this group, eight received the Director’s Award for Innovation and Excellence for their progressive ideas and actions to improve and strengthen their fairs. Ohio Department of Agriculture Interim Director Tim Derickson presented each winner with a certificate. State Sen. Andrew Brenner received a certificate of recognition for his outstanding contributions to the success of the Delaware County Fair. Brenner is currently serving as Ohio’s state senator for the Ohio 19 Senate District, which covers part of Franklin County, Delaware and Knox counties. Prior to his recent election to the Ohio Senate, Brenner served as an Ohio representative covering western Delaware County. He also served as Delaware County Recorder from 2005-2010. While serving as state representative, Brenner was integral in helping the Delaware County Agricultural Society get the bed tax passed on the March 2016 ballot for the Delaware County Fair. It adds a 3 percent tax that goes to the fairgrounds on every hotel room rented in Delaware County. The money can be used for infrastructure needs and new buildings. To get the lodging tax onto the ballot, support was needed from local and state officials. Many meetings were held and voices heard regarding the pros and cons of the lodging tax. Brenner was a diehard supporter of the bed tax from the very beginning. He is seen at the fair every year and is a supporter of the junior fair and senior fair events. Whether it is buying livestock at the Junior Fair Sale, visiting the Republican booth in the Merchant’s Building or attending the horse races, he is active in fair activities. He is supportive of all events the fair hosts as he understands the importance of a year-round venue that adds economic development to the county. 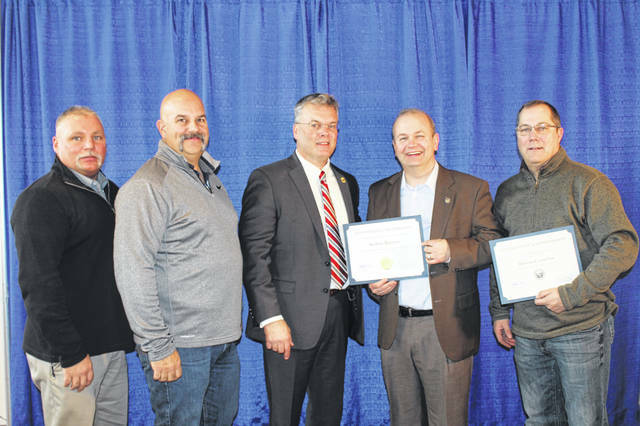 In addition, Derickson presented a certificate of recognition to the Delaware County Fair for the completion of an outstanding 2018 fair season. The presentation was made during the annual meeting of Ohio’s 94 agricultural societies at the Ohio Fair Managers Association Convention. Fair board delegates from Ohio’s county and independent fairs, and the Ohio State Fair, participated in the convention in Columbus. Ohio’s 94 county and independent fairs and the Ohio State Fair support the local economy and help educate the public about the importance of agriculture and the many necessities it provides, including food, clothing, shelter, fuel and energy. In addition to setting and approving dates for the independent and county fairs, the department is responsible for helping assure the safety of amusement rides, for monitoring livestock shows to help assure honest competition, and for coordinating animal health efforts with designated local veterinarians. The 2019 dates for the Delaware County Fair are Sept. 14-21. For more information on the Delaware County Fair, visit the fair’s website at www.delawarecountyfair.com and/or like the fair on Facebook. For more information on Ohio’s fairs, including a listing of fair dates for the 2019 season, visit www.agri.ohio.gov.